As photographers, we like to say it is all about the photograph and the art of making those photographs. And it is, but I also believe there is a little something in all of us, both professional and amateur, that likes new gear, gadgets, and software. We read blogs about it, discuss it over drinks or on assignment, and sometimes even long after it. Well if you don't have thousands of dollars in your pocket, let me offer you three ways to satisfying the desire for some new gear without having to explain anything to your accountant, spouse, employer. When was the last time you saw a lens keeper. Many of you probably don't even know what one looks like, and in fact, most professional photographers, and for that matter, most amateurs, wouldn't be caught dead using one. It is one of those accessories right up there with the Mickey Mouse camera strap that cause photographers to chuckle behind a colleague's back. 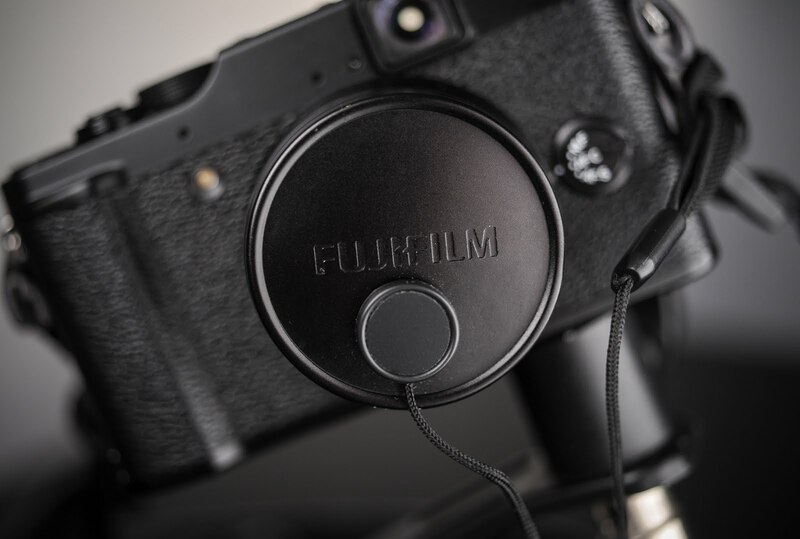 However, when I purchased my Fujifilm X10, I found that I was always taking the lens cap off, putting it in my pocket, taking a photo, then digging in my pocket in order to replace the cap. That's when I remembered this long ago forgotten gadget. And lo and behold it is still being sold. I picked mine up at Walmart for under $5.00 and it is the greatest thing. While it may not be practical for the lens cap on the 70-200mm, it is perfect for a compact camera. I recently broke this 77mm filter yet the 24-70mm lens remained undamaged. You can add filters to the front of your lens for all sorts of reasons, special effects, color tint, close-ups, neutral density or polarizing, but with the exception of a neutral density filter, I haven't added one of these filter since I started shooting digital in 1999. 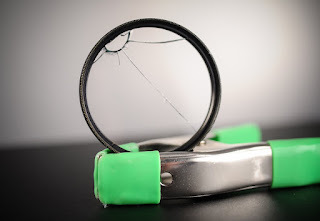 I do, however, without exception, use a skylight, ultraviolet or clear glass filter to protect the front lens element from nicks and scratches. There has been a handful of occasions where I've smashed or broken one of these filters and yet there was no damage to the lens. This includes dropping a lens on concrete pavement. A good 77mm clear NC glass filter will run you about $89.00. Of course, you can find cheaper filters, but remember that the lens you are attaching them to probably cost around 20 times the cost of that filter. I do sometimes remove the filter when in the studio or some other safe environment. Think of this as really cheap insurance. Manfrotto 175F1 spring grip clamp with attached flash shoe. AKA, the Justin Clamp. I shoot a fair amount of environmental portraits as part of my job and most of the time I get about five minutes to visit an office, figure out a good angle, get the shot and get out. Even though five minutes is not much time, I still like to use at least two off-camera strobes, perhaps even adding a gel to one of them, combined with ambient light to get the best natural portrait possible. Plus, with such a short window of opportunity, I don't want to mess with light stands, umbrellas, reflectors or even a softbox. 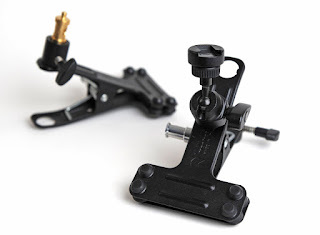 In these situations, I almost always turn to the Justin Clamp from Manfrotto. This simple accessory will quickly become one of the most useful accessories in your portrait kit. With one strobe attached to the flash shoe of the clamp, you can clip this to just about anything, from a door frame to a flat screen TV, and if there are removable ceiling tiles, it can be attached to the grid. And even if you don't use the clamp as intended, it acts as a very stable base so you to set the flash on a desk or atop a file cabinet. I then hand hold the second flash, trigger both with an SU 800 attached to the camera and am in and out in no time. Now put away the credit card and treat yourself to a nice dinner with all the money you just saved. Better yet, get out and make good pictures.